Online criminology master's programs train students to become sociologists who specialize in criminal behavior and the causes and effects of crime. Criminologists must have a comprehensive understanding of the basic elements of psychology, the criminal justice system, and current law enforcement practices. This combination of skills is unique to this particular area of sociology, increasingly in demand due to the influx of terrorism and cybercrime in all corners of the globe. A salary survey conducted by the National Association of Colleges and Employers lists criminologists as the top earners in the broad category of social sciences, earning up to $50,000 a year. Choosing a program in criminology to suit your individual career aspirations may seem challenging. While a criminology and criminal justice degree may seem to be the same, criminology is rooted in sociology and psychology. Top online criminology master's programs explore the socioeconomic, political, and environmental factors affecting crime. Students learn social and psychological profiles, behaviors of high-risk personalities, and ethics and policy-making surrounding crime in the U.S. Many criminology master's programs are customizable to your area of interest and professional goals. Studying general criminology can prepare you for your choice of criminal justice, social service, or law enforcement jobs. Some online criminology master's programs offer concentrations in areas such as cybercrime, human behavior, and leadership. Florida State University ranks #1 on The 10 Best Online Master's in Criminology Programs! Based in Tallahassee, Florida State University offers a completely online master's degree in criminology within its College of Criminology and Criminal Justice. FSU's program equips graduates with advanced independent critical thinking skills, delivered in a convenient format that allows online students to complete the program at their own pace, without ever visiting the physical campus. Applicants must hold a bachelor's degree from an accredited institution and submit GRE scores, although professionals with at least five years of experience in a criminal justice-related field may be exempt from the latter requirement. The core curriculum demonstrates a theoretical and research-based approach to the discipline, with courses in applied statistics in criminology, computer applications in criminal justice, and surveys in both criminal justice and criminological theories. Elective course topics include victimology, policy & society, penology, and social justice. A minimum 3.0 GPA must be maintained throughout the program; more specifically, a grade of “B” or above must be maintained in all coursework and a grade of “C” or above in all required courses in the program's curriculum. Students must complete a total of 36 hours of coursework. Transfer students may apply a maximum of six credit hours from a previous program at an accredited university. FSU's master's degree in criminology online program offers the same support services as its on-campus counterpart. Distance learners who reside out of state and in-state students pay the same tuition rate. FSU is regionally accredited from the Southern Association of Colleges and Schools. University of California - Irvine ranks #2 on The 10 Best Online Master's in Criminology Programs! University of California-Irvine offers a master's degree in criminology, law and society that can be completed online, with the exception of one in-person component: an on-campus prerequisite course introducing students to criminology, law and society. The accelerated, introductory course provides an immersion experience over five days and is typically taken prior to the beginning of the fall quarter, during the first week of September. Designed for professionals working in criminology or a related field, UC Irvine's accelerated curriculum covers topics in research methods, leadership, and prevention of errors in justice over 13 courses. Students gain fundamental knowledge in theory and obtain skills that they can apply in real world scenarios. Students may complete a graduate thesis or choose the non-thesis option, which requires the completion of a capstone course in social problems, law, and policy in the winter quarter of the student's second year of study in the program. UC Irvine's online master's degree in criminology consists of 52 units of coursework over six quarter semesters. Students can complete the program within two years of committed full-time study. Admission requires submission of official transcripts that demonstrate completion of a bachelor's degree with a minimum 3.0 GPA, three letters of recommendation, and two formal written statements: a personal history and a statement of purpose. UC Irvine is regionally accredited from the Western Association of Schools and Colleges. University of Texas at Dallas ranks #3 on The 10 Best Online Master's in Criminology Programs! UT Dallas' MS in Criminology caters to working professionals who seek maximum flexibility in online criminology master's programs. The fully online degree prepares graduates for greater employment opportunities in analytic, research, or managerial positions. Some graduates go on to apply to law school or complete their doctorate at UT. Students who choose to earn a Ph.D typically pursue the writing track; the non-writing track better-suits those pursuing a terminal degree. The curriculum encapsulates 36 hours of coursework, including 15 required core classes and 15 electives. After completion of the core and elective components, students embark upon six hours in either independent research or non-criminology elective topics. Core courses cover criminology topics such as etiology of crime and criminality, quantitative methods, and crime and justice policy. Students must finish each of the five core courses with a grade of “A” or will be required to retake the course. Students who fail to earn an “A” in a repeated course will be dropped from the program. Admission requirements include a GPA of at least 3.2 in undergraduate studies from an accredited institution, and a combined verbal and quantitative GRE score of at least 300. Students must maintain a minimum 3.0 GPA in all program coursework in order to graduate. UT Dallas is regionally accredited from the Southern Association of Colleges and Schools Commission on Colleges (SACSCOC). Western Kentucky University ranks #4 on The 10 Best Online Master's in Criminology Programs! Located in Bowling Green, Western Kentucky University's master's in criminology combines a focus on criminal delinquency and deviance with the examination of societal responses to those topics. The curriculum encompasses 30 total credit hours: 15 in core classes and 15 in elective credits. Students must complete a research project in peer-reviewed journal article format and subsequent oral examination in order to graduate. Learners can complete the program in one year of full time study, however, courses are available on-demand, allowing students to set their own schedule for completion. With emphasis on research and analysis, the curriculum examines the underlying causes of criminal offenses and victimization with regard to violent and property crimes. Core classes span the sociology and criminology disciplines. Elective courses in these disciplines explore penology, victimology, environmental criminology, and comparative criminology. A maximum of 12 credit hours may be taken in related, non-criminology electives, including corrections and criminal justice topics such as policing and society, crime and popular culture, and administration of corrections and juvenile justice. Transfer students may apply a maximum of 12 credit hours of graduate study from other WKU departments or other regionally accredited institutions. In-state and out-of-state residents pay the same tuition rates. All applicants must submit a GRE score with their application. WKU is regionally accredited from the Southern Association of Colleges and Schools Commission on Colleges. Missouri State University ranks #5 on The 10 Best Online Master's in Criminology Programs! The master's degree in criminology online at Missouri State University-Springfield mimics the on-campus accelerated format option. MSU's program focuses on critical analysis and effective leadership, based on theoretical knowledge and advanced research techniques. The program caters to students seeking professional development or those preparing for law and doctoral programs. The degree offers an optional thesis and subsequent oral defense. The non-thesis track requires a capstone project centered on in-depth analysis of policy. All distance learners pay the same tuition rate, regardless of their state residency status, but cost varies according to whether an individual chooses the thesis or non-thesis track. Admission requires a completed baccalaureate degree from an accredited university in criminology, criminal justice, or a related field, and either a minimum 3.0 GPA or a GRE combined score of 290. Students must also schedule an advising appointment to obtain a release before they can formally register for classes. Summer enrollment enables a student to complete the four-semester program within 18 months. The curriculum requires completion of a minimum 30 hours, the majority comprising core classes in criminal justice policy and theory. Students may take between 12 and 18 credit hours in elective courses. Advisor approval must be given prior to registration for an elective course outside of the specified discipline. Graduates may pursue optional certification in homeland security and community corrections. MSU is regionally accredited from the Higher Learning Commission. Regis University ranks among The 10 Best Online Master's in Criminology Programs! Based in Denver, Colorado, Regis University's MS in Criminology serves students interested in the study of criminal behavior while maintaining its signature Jesuit, Catholic perspective. Learners can complete the accelerated, 36-credit-hour program entirely online and, with start dates offered six times a year, they can study flexibly at their own pace. In addition, starting in Fall, 2018 all ground-based courses will be 5 weeks in duration instead of 8 weeks. This will enable students to finish the program in 18 months if they so desire. Application requires two professional recommendations, two admission essays (one on previous education and experience; the other on future aspirations for career focus), official transcripts, a completed application to the program, and a faculty interview. Students choose from three concentrations, dependent upon their career interests: leadership, human behavior, or cybercrime/terrorism. The curriculum caters to the individual, including life-long career services and network support from faculty and administration for the duration of the program. Course topics include criminal psychopathology, transnational crime, animal exploitation, computer forensics, and rapid decision making. The program has several options for student's final projects. There is a 16-week capstone project worth six credit hours. In the capstone, students apply skills accumulated throughout the program to create a client plan or research-based project proposal. Ultimately, a student presents the capstone to an audience of their peers, faculty, and staff. Each week of coursework explores a new topic, such as research methodology quantitative versus qualitative, effective thesis presentations, and criminology theory. Another option is a 16-week internship in any entity related to the study of Criminology. A final option is a three-credit Comprehensive Exam analyzing Jesuit principles. With this option, an extra 3-hour master's class is required for a total of six credit hours. Online students and traditional students pay the same tuition rates, regardless of state residency. Regis University is regionally accredited by the Higher Learning Commission. San Jose State University ranks among The 10 Best Online Master's in Criminology Programs! SJSU offers a master of science in criminology in global criminology within its Department of Justice Studies that can be completed entirely online. The “special session” program employs a cohort model, maintained by the university's College of International and Extended Studies. Prospective students must submit a special session application form, two letters of recommendation, and evidence of a completed baccalaureate degree in criminal justice, criminology, or justice studies from an accredited university. The program requires a minimum 3.0 GPA in the final 60 credits of baccalaureate coursework, as well as a minimum 3.2 GPA in a student's chosen major. Students with an undergraduate degree in a field other than those aforementioned must complete prerequisite courses related to criminology upon admission. Core classes encompass 15 credit hours in a variety of topics, including comparative criminal justice systems and international human rights. Students must complete a final project and a graduation writing assessment before earning the degree. Other courses in the curriculum include cyber forensics, international crime and gender, and pragmatic research methods and statistics applications. Distance learners at SJSU pay per course credit hour instead of the traditional student standard tuition rate, excluding the campus fees required of on-campus students. The Justice Studies department at SJSU boasts the oldest criminal-justice-degree-granting program in the U.S. SJSU is regionally accredited from WASC Senior College and University Commission. 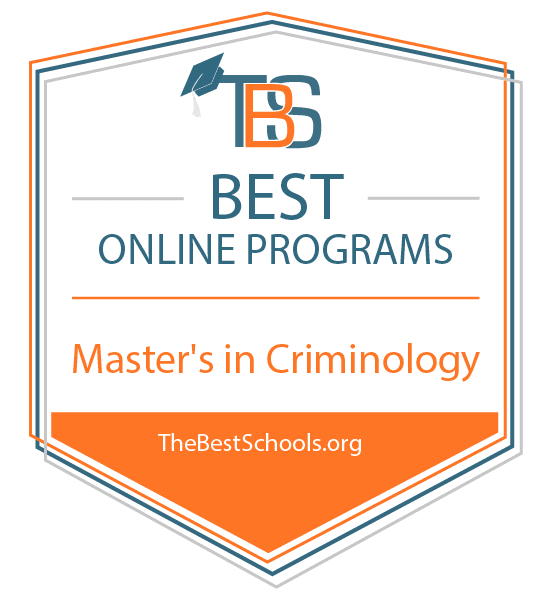 California University of Pennsylvania ranks among The 10 Best Online Master's in Criminology Programs! Located in California, Pennsylvania, Cal U offers an online master of arts in social science applied criminology, with enrollment options in either the fall or spring semester. Like many online criminology master's programs, Cal U's MA can be completed in approximately one year of full-time study. The program encompasses 30 credit hours, six of which can be applied from prior learning if a student previously attended the FBI National Academy, the Federal Law Enforcement Training Center, or completed another relevant training program or holds pertinent professional certifications. The aforementioned six credit hours will satisfy the required capstone project. For students without prior learning experience, the capstone project includes one of four options: internship, thesis, study abroad in a justice-related field location, ora certificate for each course completed via the Pennsylvania Center for Investigative and Forensic Sciences. The curriculum combines knowledge in criminology theory and research, with required courses in equivocal death analysis, criminal investigative analysis, and geographic crime analysis. Students may obtain a graduate certificate in either applied criminology or behavioral crime analysis. Applicants should demonstrate a minimum 3.0 GPA in baccalaureate studies, though applicants with lower GPAs may be granted conditional admission to the program. Online students pay a discounted rate, regardless of state residency. The master's degree in criminology program originated through a partnership with some of the first criminal profilers at FBI Academy located in Quantico, Virginia. Cal U is regionally accredited from the Middle States Commission on Higher Education. Kent State University ranks among The 10 Best Online Master's in Criminology Programs! Located in Kent, Ohio, Kent State's fully online master of arts in criminology and criminal justice program allows distance learners the opportunity to complete the program at their own pace. The master's in criminology includes an individualized degree plan best suited to each student's personal schedule and career goals. Advisors recommended a course load of two courses per 7-week semester for students looking to graduate from the program in less than two years. To complete the degree, students earn a total of 33 credits, 11 chosen from elective course topics. The program culminates in a capstone project that accounts for three credit hours. Application requires three letters of recommendation, official transcripts, a resume/CV, and a goal statement. Online and on-campus students pay the same tuition rate for the same courses in varying delivery formats. The curriculum takes a multidisciplinary approach, including classes in community corrections, homeland security, and law, justice, and society. Each course encompasses multiple sections, in the interest of keeping a low student-instructor ratio. Concentration options include corrections, global security, policing, and victimology. Course content encompasses PowerPoint presentations, video and audio, text, live chats, and discussion groups, all delivered through the Blackboard Learn system. Students may need the ability to record video and audio, depending upon the program focus chosen. Kent State University became a member of the North Central Association in 1915 and is regionally accredited from the Higher Learning Commission. Texas A&M University - Commerce ranks among The 10 Best Online Master's in Criminology Programs! Founded in 1889, Texas A&M University's Commerce, Texas location offers more than 100 degrees to both undergraduate and graduate students. Its online master of science in applied criminology accepts domestic applications year-round, offering students the flexibility of applying and beginning the program whenever most convenient for their schedule. Applicable to both aspiring and advancing criminal justice professionals, the 36-credit-hour program consists of a total of 12 courses, each five weeks in duration. The curriculum incorporates seminars in policing and law enforcement, criminology, and corrections. Concentration options include general criminology, criminal justice administration and management, and homeland security. Graduation requires completion of four core classes and a capstone sequence component. Students may complete an optional thesis prior to graduation. Learners can complete the program in 18 months of full-time study. Texas A&M University-Commerce is regionally accredited from the Southern Association of Colleges and Schools. The study of criminology prepares graduates to approach crime and criminal behavior from both a scientific and scholarly standpoint. In addition to gaining soft skills in decision-making and strategic planning, by completing an online criminology master's program you'll develop a critical eye for predictive and preventive measures concerning contemporary crime, cultural and societal cause and effect, and cybercrime. The following are just a few career options available to graduates of criminology master's programs. Sociologist: Criminologists belong to the broader category of sociologists. Sociologists conduct research into the psychology and social behavior of certain cultural groups, controlled demographics, and organized institutions. Sociologists are required to have at least a master's degree to enter the field, and should be well-versed in statistics and various research methods. Private Detective or Investigator: Private detectives and investigators perform intensive research into the personal, financial, and/or legal issues of a particular individual or organization. They are adept at conducting research conclusively and confidentially, often for private and/or high-profile clients. Advancement in the field requires licensure in most states in the U.S.
Claims Adjuster, Appraiser, Examiner, or Investigator: Claims adjusters, appraisers, examiners, and investigators evaluate insurance claims and determine if and when insurance companies should pay those claims. While not always required for entry-level jobs, many employers prefer professionals who have at least a bachelor's degree and work experience. Criminology education and experience is also preferred by some insurance companies that require advanced interrogation and interview skills.